Bachata is a popular guitar music from the Dominican Republic. While bachata is based on the bolero rhythm, bachateros have traditionally included other kinds of music like son, merengue, vals and ranchera in their repertoires. The influence of all of these styles, and particularly that of merengue, can be felt in the rhythms, harmonies and melodies of bachata proper. Guitar music has always been a part of the Dominican musical landscape, but the first bachata recognized as such was recorded in 1961 by José Manuel Calderón. The bachata of Calderón and his contemporaries was virtually identical to the bolero of other Latin American countries like Puerto Rico and Ecuador. In fact many of the songs which these bachateros recorded were covers of earlier boleros, and the music was viewed by society at large in the same way that bolero was viewed throughout Latin America — a romantic music popular with lovers and serenaders. In time, however, bachata began to be associated with another world, that of prostitution, poverty and delincuency. The reasons for this are many and complex and involve the conflicts within Dominican society around poverty and wealth, tradition and modernity, as well as genuine bad faith on the part of other elements in the music industry. So strong was the stigma against bachata that only one national radio station would play it. While this situation was deplorable and extremely difficult for the musicians involved, it also helped to consolidate the genre. Relegated to the brothel and the barrio, bachata began to tell the stories of that world, the experiences of the lover of a prostitute, the poor country boy who gets to the city and gets ripped off, the plight of the barrio dweller without light or water—all replete with slang and sexual double entendre. From about 1970 to about 1990, bachata was thoroughly unique among Latin American musical genres in its free expression of the underground life of a nation. This free expression naturally provoked even more fiercely the contempt of the Dominican mainstream. Ironically, it was the most despised of these cabaret bachateros, Blas Durán, the master of sexual double entendre, whose music marked the end of bachata’s isolation when he began to record with an electric guitar in 1987. After Durán’s innovation bachata’s popularity began to soar, as Anthony Santos and other bachateros used the new style to record more acceptable, romantic songs. The influence of merengue became marked in the rhythm and the guitar lines of the music, and in fact modern bachata was first made popular by the bachateros’ merengues rather than by their bachatas. Several middle class musicians, notably Juan Luis Guerra, also experimented with the form, and were so successful that the music began to be accepted by all sectors of society. 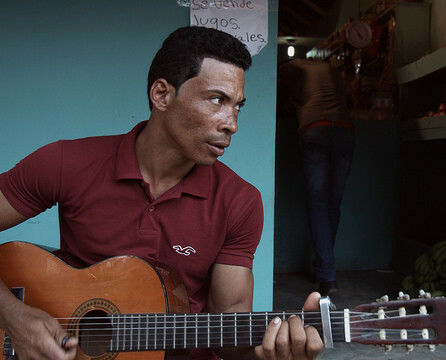 In its current form, bachata is listened to throughout Latin America, and is probably the most popular kind of Latin music in New York City today. It has been fused with other styles, like vallenato (Monchy y Alexandra, among others) and R&B (Aventura), with great success. Very nice article as a whole. This page is of course cited and acknowledged in many ways. If you want to learn how Bachata as a whole is received especially in Europe, I also recommend my article.